RLB Echad LLC, Faith Based Consulting. So that Relgion, Leadership and Business May Find Echad. The New Strongs Exhaustive Concordance of The Bible, James Strong, LL.D., S.T.D. 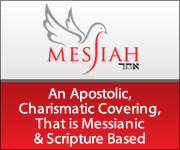 Messiah Echad is honored to serve as an Apostolic, Charismatic covering that is Messianic and Scripture Based. The model we follow is for Messiah Echad to be a physical example to our network congregations and serve as a spiritual leader around them, which enables us to safely guide believers through our gates and into the right places of worship. And this model has proven successful, as seen in our Join Messiah Echad and Apostolic Covering Videos, which showcase our reach. So once you make the decision that “your people will be my people and your God, my God” (Ruth 1:16), we invite you to become recognized by Messiah Echad. The recognition process begins with our asking your leaders to spend some time connecting with our website, following us on social media and reviewing our teachings. Then after this introductory period, you should request an individual, family and or congregational interview, to profess alignment with our mission and vision and demonstrate agreement with our statements of faith. From there and once you are recognized, we proudly display you on our website and we ask that you do the same for us on yours. Lastly, we also conduct ordinations, as He leads us. So send us an email or give us a call (1.512.525.0736), to get the process started! Harry L. Zeplin. 28 Mar. 2015. Pastor.